Falling in Reverse have announced April 7, 2017 as the release date for their fourth album Coming Home (Epitaph). The band has also shared the track listing, album artwork, and the new song “Loser.” Listen to “Loser” here and here. The follow-up to 2015’s Just Like You, Coming Home finds the band exploring its sound, all the while retaining the signature ethos and aesthetic that has won the love and loyalty of its incredibly invested fans and followers. Listen to the atmospheric title track, released in late December, here. Coming Home is available for pre-order here. 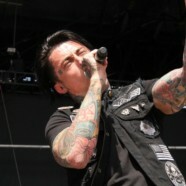 Falling in Reverse will embark on a busy touring schedule in support of the album. The band is currently on tour with Issues and Motionless in White.